WiseRecovery can help you recover lost or deleted data from SD card, cameras, cell phones, hard drives or other storage media. It performs read only operation and will never do any damage to your card or hard drive. WiseRecovery also can recover your deleted or lost files due to situations of corruption, formatting, virus attack, etc. Images: When you do a recovery of photos with WiseRecovery, the recovered photos will appear as thumbnails in the main window. You can have a preview of the images before final recovery and choose the photos you want to recover. It is very easy to operate. Audio : When you lose your audio files, maybe some beautiful songs you value so much, WiseRecovery can do a good job. It supports various audio file formats, such as RPS, MP3, AU, WAV, MIDI, OGG, AIFF, RM, WMA, RA, M4P and M4A. Recover your precious audio files with WiseRecovery is not a dream. Video : Most recovery tools don’t support video recovery, because it requires more technical skills when developing the software. But WiseRecovery can do an efficient work in recovering videos. It supports all the video file formats, including MP4, 3GP, AVI, MPEG, Matroska Video File (MKV), AVCHD Video File (MTS), Divx, etc. Emails: To recover emails is not an easy work. It is different from recovering photos or audio files, because emails are not the kind of files deleted directly from your SD card or computer hard drive. It requires more work in the functions of the recovery. WiseRecovery is developed by many top engineers in our company with so much developing experience. So, you don’t need to worry that your deleted email cannot be back. Archives: Many people try to find a high efficient recovery tool because they don’t need to recover ordinary data they lost like photos, but some special ones like archives. Archive recovery is not supported by all the recovery software on the market, and only a few recovery tools can do this job. WiseRecovery is the one that supports archives recovery and also adept at it. With WiseRecovery, nothing is impossible. 1. 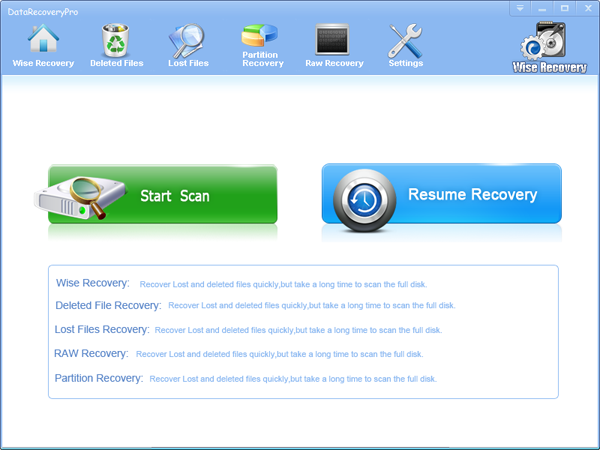 Run WiseRecovery software, and click on Start scan. 2. Choose the drive to start scanning. 3. Now, the scanning process will commence. After scanning, list of file types will be displayed in the left pane. 4. Click each file type to view files in it. You will see thumbnails when you click on the file type. 5. You can either recover all or selected files by clicking the Recovery button. Someone thinks that when you delete something on your computer or PC, you will not recover it forever. But the answer is definitely not. People like to empty Recycle Bin to optimize the speeding of computer. But if you are emptied your Recycle Bin without backup, what should you do to recover your important and irreplaceable files and data? But the reality is when you emptied the Recycle Bin, your files and data is not deleted and they still exist in your computer. Just the files’ name is removed and you can not search them any more. So you should understand that you deleted a file from the Recycle Bin does not mean delete it permanently. WiseRecoverypro provides a great recovery function that can recover the deleted Emails, Word, Excel, PowerPoint, photo, database, video, audio, and all file formats and folders in Windows 2000, XP, 2003, Vista, 2008, Windows 7, 8, which have been deleted from the Windows Recycle Bin. 1. Download WiseRecovery Data Recovery Software, install it and launch it. Click the “Start Scan” button on the main window of Data WiseRecovery. 2. You can see the list of all volumes found on your computer, select the exact drive and click the “Next” button to start scanning. If you can’t see the drive, please make sure your external drives are connected, and click ‘Refresh’ button. 4.Select the files or folders that you want to recover and press the “Recover” button, on the popup window, please select target directory to save the recovered files. WiseRecovery will recover files instantly. Now you can click ‘open the destination directory‘ button to see the recovered files!